Hi, I’m Mike, author of the bestselling books Bigger Leaner Stronger, Thinner Leaner Stronger, and The Shredded Chef. Have you ever struggled so much to get fit, healthy, and happy that you wondered if you should simply give up? Today, I’m a “super-fit” bestselling author with over one million books sold, and the owner and founder of several 7- and 8-figure businesses, including Muscle for Life, Legion Athletics, and Waterbury Publications. Did I sell my soul to the Dread Lord Cthulhu? Discover the one weird trick to melting belly fat, debt, and existential angst...in just 5 minutes per day? Develop an expensive but highly productive cocaine habit? To do that, I share wisdom and insights from hundreds of scientific studies and dozens of legendary artists, authors, entrepreneurs, philosophers, generals, and conquerors, as well as my own biggest “a ha” moments that are most responsible for where I am today. For instance, what if I told you that filling out one simple little sentence could increase your chances of achieving a goal by 100 to 200 percent? What if this sentence worked subconsciously to automatically reduce your need for motivation, willpower, or desire? And what if you could use this sentence for all types of goals, including exercise, diet, health, and everything else? Thanks to the work of a number of psychologists over the course of a decade, this sentence exists, and it has three parts: what, when, and where. This sentence was the focus of a study conducted by researchers at The University of Bath, who randomly assigned 248 adults to one of three groups. People who were asked to read a few paragraphs from a random novel before working out. People who were asked to read a pamphlet on the heart benefits of exercise, and were told that most young adults who stick to an exercise program reduce their risk of heart disease. Thirty-eight percent of participants in the first group exercised at least once per week. Thirty-five percent of participants in the second group exercised at least once per week. Ninety-one percent of participants in the third group exercised at least once per week. No, that’s not a typo. By simply writing when and where exercise was going to occur, follow-through skyrocketed. Similar results have been seen in other exercise studies, as well as research analyzing a variety of positive behaviors ranging from breast self-examination to dietary adherence, condom usage, breast and cervical screenings, vitamin supplementation, alcohol intake, and more. As it happens, there are over one hundred published studies on this phenomenon, and the conclusion is crystal clear: if you explicitly state what you’re going to do, when you’re going to do it, and where you’re going to do it, you’re much more likely to actually do it. What–when–where statements are far more effective for regulating behavior than relying on inspiration or willpower to strike at the right moment, because they speak the brain’s natural language, creating a trigger-and-response mechanism that doesn’t require conscious monitoring or analysis. That's just a small sample of the practical, evidence-based knowledge you’re going to learn in this book. Why you must stop telling yourself that you need things to be “just right” before you can start doing the thing (and what to do instead). Learn by doing: 14 hands-on exercises that show you how to implement the book’s key principles and see immediate changes in your life. The single most important question you have to ask yourself when setting goals (and it’s not “what do I want?”). When and how to use both optimism and pessimism to improve your decision making and avoid painful mistakes, according to top psychologists. How to use what scientists call “prospective hindsight” to increase your chances to foresee future outcomes by up to 30%. The single factor that is most powerfully correlated with flourishing in life, according to a groundbreaking 75-year Harvard study. How “Five Minute Favors” can transform your relationships and put you on the fast track to more joy, love, and success. Now, as much as I believe this book can change lives, it’s not for everyone. It’s not for people who are happy coasting on cozy goals and pleasures, and who are contented by merely buying and consuming things that others create. It’s not for people who want to languish in a fool’s paradise and avoid the ground truth about positive change—although ultimately rewarding, the process is often hard, draining, boring, and even depressing. It’s not even necessarily people who are “unmotivated,” because in my experience, this is very difficult to change. In short, this book is for people who want to be better than they are right now. People who have a vision for their bodies and lives, and who are driven to break free of artificial limitations and realize their unique talents and fulfill their true potentialities. It’s for people who hate feeling like they’re moving in slow motion, who don’t want to surrender to the deadening effects of exhaustion, listlessness, and inertia, and who want to develop the physical, emotional, and spiritual strength and energy needed to look and live vigorously. It’s for people who are driven to heal what’s unhealthy, fix what’s broken, and improve what’s lacking, and who believe that no matter the circumstances, something can always be done about it. It’s for people who want to feel in control of their destinies and who want to reach their graves with stories worth telling. If you’re one of these people, then this book was written for you. It’s going to inspire you with compelling ideas and stories, and empower you with a set of reliable, science-based principles, strategies, and habits that have been proven to work with a broad range of personalities and produce sustainable, long-term results. Armed with the information you’ll learn inside, you’re going to start living life with more energy, enthusiasm, and nerve. You’re going to develop a powerfully new paradigm for interacting with yourself and your environment. Click the button below, buy this book today, and by the end of it, you will never again wonder what it takes to get and stay motivated to build the body and life of your dreams. Matthews has hit it out of the ballpark with this Little Black Book. This is not your typical ‘rah rah’ self-help book full of tired clichés. It’s a unique, meticulously researched and compelling combination of storytelling, science, and practical tools and takeaways. This is a good, helpful, important book that establishes Mike as the Jordan Peterson of fitness. Any person who wants to train more effectively will benefit from reading it between sets, and will never give a copy to the guys he wants to beat. without action is just a dream. 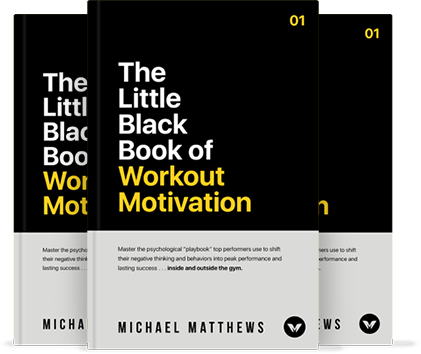 The Little Black Book provides all the tools you need to turn your goals into reality — and to never, ever feel ‘stuck’ again. Really Set Themselves Up to Win. Mike has already taught us how to be bigger, leaner and stronger—and it works. Now he teaches how to be BETTER in all areas of life. A concise, indispensable guide to fitness and effectiveness. Mike Matthews brings you motivation, guidance, advice and a plan to better yourself in a humble, yet authoritative way. You know he has your best interests in mind as you read this, and you will feel he is talking directly to you. This book will challenge you, it will make you think, it will force you to go outside your comfort zone. It will help you build much more than motivation, but an inner drive to succeed so you can weather any storm. In the charlatan-packed world of the fitness industry, Mike Matthews is a breath of fresh air. This book will inspire you and inform you with quality applicable information that isn’t biased. 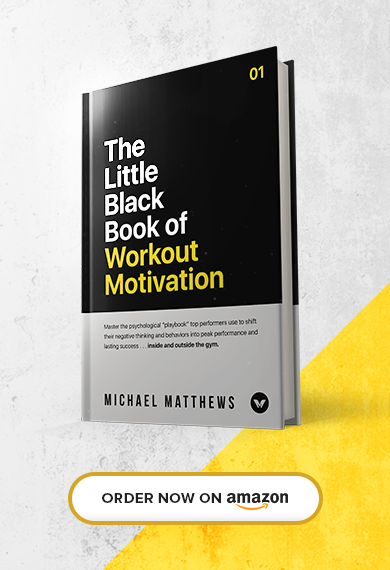 If you want to improve your physique and your life do yourself a favor and read The Little Black Book. I love Mike’s writing. Backed by a sh*t ton of research, crystal clear and always actionable. Mike Matthews delivers another gem. The Little Black Book is chock-full of unbiased, evidence-based knowledge that you should not live without. A must-read. Read this book and absorb and apply its wisdom, and your life will get better. It’s that simple. 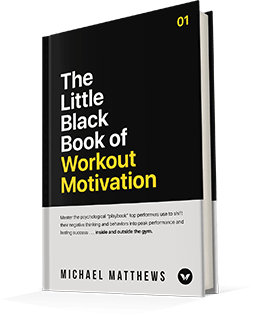 Matthews is a master of the mental side of fitness, so you’ll finish this book fired up to get to work—and, more importantly, with the practical tools you need to start your journey successfully. Enter your first name and email address below to unlock the first three chapters of The Little Black Book! Yes! Send Me My Free Chapters! 100% privacy! I'll never rent or sell your information. Pinky swear! You'll be receiving the first three chapters soon! You've already entered to receive the first three chapters!